Dandavats. 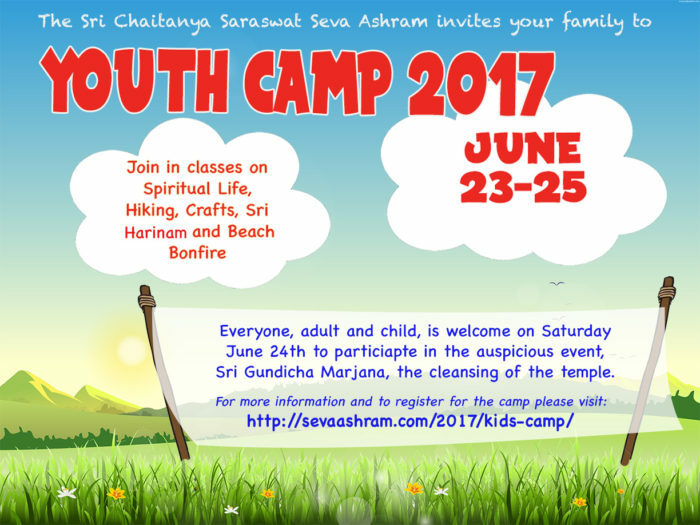 Kids’ camp is quickly approaching from June 24-25th (participating devotees may plan to arrive and set-up camp Friday if they choose) and we are looking forward to having all your association here at the Ashram. Camp is a wonderful opportunity to get the association of devotees and participate in some seva. This year the camp will fall during the festival of Gundicha Marjan. This is a special opportunity to come and participate in the cleaning of the Ashram! We are asking families for a suggested donation of $50 per child to purchase food and materials for the duration of the camp. You can pay securely through the Ashram website, or give the money directly to Sripad Hasyapriya Prabhu or Srila Bhakti Pavan Janardan Maharaj upon your arrival. Of course all are welcomed to attend and no one shall be turned away. In addition if you have any desire to teach an activity or have materials that you can bring for the camp please email or call me at your earliest convenience. Camping is recommended. If you need a bed please contact Krsna Priya.